TVB has announced the tenth series premiere of their highly popular award-winning game show, Super Trio <獎門人>! 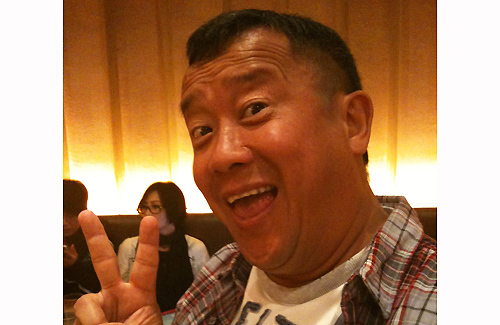 The tenth series, hosted by Eric Tsang (曾志偉), is currently planned for a May 26, 2013 premiere on TVB Jade. The series, tentatively titled, Super Trio Game Master 2013 <一家大細獎門人>, will be used to commemorate Eric’s 60th birthday. TVB has ordered 20 episodes for the show, and with the addition of new entertaining games and a revamped format, the TVB family hopes to bring together past and present celebrity guests to star on the hilarious game series. All of Eric’s past assistant presenters of Super Trio is slated to return to host this series together. Co-presenters include original hosts Jordan Chan (陳小春) and Jerry Lamb (林曉峰), Chin Kar Lok (錢嘉樂), Lan Sai (蘭茜), Wong Cho Lam (王祖藍), Louis Yuen (阮兆祥), King Kong (金剛), Elvina Kong (江欣燕), and EO2’s Otto Wong (王志安). Debuting in 1995, Super Trio remains as one of Hong Kong’s longest-running variety game show in history. The entertainment variety program engages their celebrity guests to perform comedic skits together, such as improvisations, quizzes, and stunts. Viewership ratings for each weekly episode are consistently high, with averages of over 30 points. To celebrate the show’s long-running success, a Super Trio Best Awards Ceremony is planned to be held before the premiere of the new series. Airing as the series’ first episode, the awards will include short episodic reels of classic moments from the first nine installments. Award categories include the Most Frequent Guest Star Award, the Best Spicy Food Eater Award, the Most Loyal Award, the Best Enemies Award, and others. The tenth series will also debut a new game format, which will separate into three different categories – one for children, one for adults, and one for seniors. The goal of the new format is to target a wider selection of audiences, and to give out prizes that will correspond to the different audiences. In addition to new games, the news series will also incorporate classic, well-received games from previous installments. Such games include the Super Ping Pong Game – a game in which players are to answer questions while they play tennis table – and the Super Marathon Game – a rhyming challenge. Several episodes in the show will also be shot at overseas locations, including Japan and Southeast Asian countries. 33 comments to “Super Trio” Game Show Returns in May! Yay!! So happy! But do they really need 9 other co hosts? I get the whole 10th anniversary but that’s a lot. Seriously… King Kong and Chin Kar Lok are all that is needed. that will have me laughing on the floor for the entire night….can’t wait, but the super trios have really become a big family.so happy to see them reunite! I need Jerry Lamb – he’s hilarious!!!! I can get rid of King Kong, to me – he’s not that funny. i second that!! Jerry lamb is missed! Instead of a new format Super Trio, Tvb should come out with a new game/variety show!! It’s going to be the same batch of guest, unless Eric pulls some strings. But I will still watch it for Ka Lok! I really don’t remember Jordan Chan being a co-host in the past. Must have been really early on when the game show debuted. he quit around episode 13 in the first season due to his rising popularity following goo wak jai. i prefer chin kar lok to him anyhoo. I hope the games will be better ths time around. Games were getting repetitive and mostly consisted of throwing stuff in people’s faces. The last few series have been so crude – especially after Jerry left. I know it’s not going to have the same star-pulling power as it once had, but at least make the games entertaining. I don’t want to have to gauge my eyes out in embarrassment. Yay!!! So thrilled to read this. Really looking forward to it. But somehow I think there’ll be too many co hosts. I think they should only have Jordan Chan, Jerry Lamb and Chin Ka Lok only for co hosts! Blast from the past! Excited to relive a little bit of my childhood 🙂 Can’t wait for this! I love the older series. Recent one got a bit “too much to handle” as a family show. YES! i like jordan, ka lok and aa lo as co hosts. whoooot!!! i’ve been waiting for the day they bring back the old classic games!! i enjoyed the old games so much more than the new ones that they did. but i hope this ten season premiere won’t be the end of the game show, it’s been my favorite hk variety show and something i’ve always watched while growing up! Wasn’t Timmy Hung one of the past host too? nope. he was a regular guest, quite funny to watch! They should get some ideas from korean variety shows! Hopefully Jerry lamb is in majority of the episodes. He was really entertaining. I prefer the old series of super trios, to me it was much more hilarious than the recent episodes. I didn’t like it before probably because they’re dressed so ridiculously but one day I just soldiered on and actually enjoyed the games they play, especially with the tv celebs as guests. Now I’m hooked but so hard to buy dvds or even vcds of the old programmes. Anyone out there know where we can get them?? Can someone tell TVB to celebrate 10yrs of this programme by releasing digitally remastered copies or even do re-prints of the first season till now ??? I know Kar Lok will be ribbed terribly this time because there’ll be plenty of first-time father jokes. Good luck cuz it’s not going to happen…as it is, TVB isn’t even releasing old TV series on DVD anymore, let alone variety shows (they used to release an old show on DVD like once or twice a year, but recently stopped doing even that). Your best bet is probably scouring websites that might happen to post them (though alot of those have been shut down too and even if you do find them, the seasons will probably be incomplete)…unless you’re lucky enough to know someone who has them all on video tape…. Yay super excited….to watch Super Trio again…Could anyone tell where I could watch the older episodes of Super Trio like for exp: Part 1,2 & 3 ???? If you search these terms on Google, you should be able to find a number of episodes. A lot of them are uploaded on sites like Tudou or Youku, but they’re not the greatest of quality and it’s difficult to find all episodes. They’re so damn hard to get hold of now. Thanks for the info Skinnymocha I’ll start up my search engine lol…. Haha…yup…the first few seasons were the best and more ‘truly’ representative of what Super Trio was all about (not to mention all the ‘big name’ guests showed up during the first few seasons…the show pretty much ‘died’ after the 1999 season (that’s the season when pretty much the last of the ‘big name’ guests came on). And yes, the early seasons are definitely very hard to find (don’t forget the individual Super Trio specials that occurred in between too). That’s why I’m glad I still have my collection on video tape from way back when…. I can’t wait. He’s funny. All the Eric haters can kiss his booty. They should bring back the “flick the slippers” thing at the end when the contestants get the prizes!